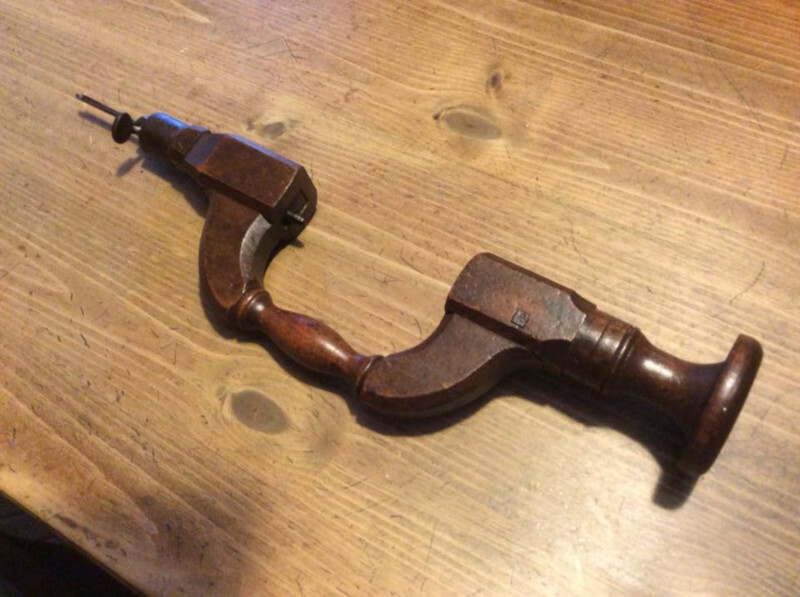 I attended The Great Planes Trading Company antique tool auction last Saturday in St. Peter’s, Missouri and came away with less money but with an early brace that has some interesting features. It probably dates sometime in the span of time shortly after The American Revolution to circa 1820 and was made by a skilled craftsman with a bent for subtle design details that added a bit of aesthetics to a tool. In this post I will explain with photos its anatomy in case any of you wish to replicate it. I view this brace as a precursor of what was to come in England and America in the decades that followed. First, the slender wrist on the crank has the lines of a typical Sheffield brace starting in the 1850s. Second, instead of the brace having a series of bit pads each bearing its own bit, this brace has a single pad with an iron chuck on it that will hold a variety of typical tapered square-tanged bits such as center, nose, and quill bits as well as countersinks, scillops, and the like. And, third, it has a spring in the chuck that is much like the push button chucks made a bit later in Sheffield. This photo shows the brace straight from the auction. The wood was extremely dry and needed to be fed in order to preserve a wonderful patina on it. The brace is 14 5/8ths inches long without the pad in the chuck. The head is 3 1/2 inches long and so is the chuck. The pad tang is 5/8ths inch in diameter. The pad, including the iron chuck, is 5 3/4ths inches long. This brace has 3-inch throw. This is the brace with the wooden pad removed. Note the saw marks on the pad tang. The iron chuck that holds bits is firmly affixed to the wooden pad. The thumb screw that tightened on bit tangs was missing. Sorting through my parts and pieces I found a thumb screw of appropriate age. It had the correct thread count, 28 threads per inch, but was slightly too large to fit the hole in the chuck. Using a tap I cleaned the rust out of the threads in the chuck. And, using a period threading die I repeatedly cut threads on the thumbscrew until it was the correct size and screwed in perfectly. I selected a short period English nose bit to put in the chuck to make sure the thumb screw would retain such bits in the chuck. This is the brace with the wood fed with beeswax and various oils, a solution I concoct. This shows a detail of the head. The square peg captures the head that has a groove around a cylindrical shaft that is integral with the head. This photo shows the pad inserted in the brace and captured by a leaf spring. The refitted thumb screw holds the bit in the chuck. This shows the thumb screw in the iron chuck retaining the bit. Above the pad and in the square pad tang hole is the iron mount for the spring. It is the rectangular feature above the pad. This shows some of the aesthetic detail carved on the brace by its maker. The head does not have a pivot dowel coming through it. The dowel was turned as a projection of the head and goes in a hole, captured there with a square peg. This is the iron chuck on a wooden pad. Note the saw marks on the pad tang.